The scheme occupies previously vacant Council land adjacent to Camberwell Green and Camberwell Magistrates Court. The design of the main entrance is distinctive, creating a strong civic presence, and large picture windows bring daylight into the heart of the building, with deep window reveals providing additional seating areas. The two levels of the library are connected by a striking American oak stair case and the scheme also features a green roof sown with wildflower seeds. The project consists of three distinct elements: the library entrance space, the ‘pedestrian spine’ and the Magistrates Court forecourt. Within the building there are different library areas on the ground floor including a children’s and young persons zone with seating and places to read. The mezzanine level serves as a quiet study area, along with the staff facilities. Also located on the first floor are the meeting rooms that can be booked for use by local community groups with views out over Camberwell Green. The new library now provides enhanced ICT facilities and has free wireless internet allowing users to bring their own IT into the building. 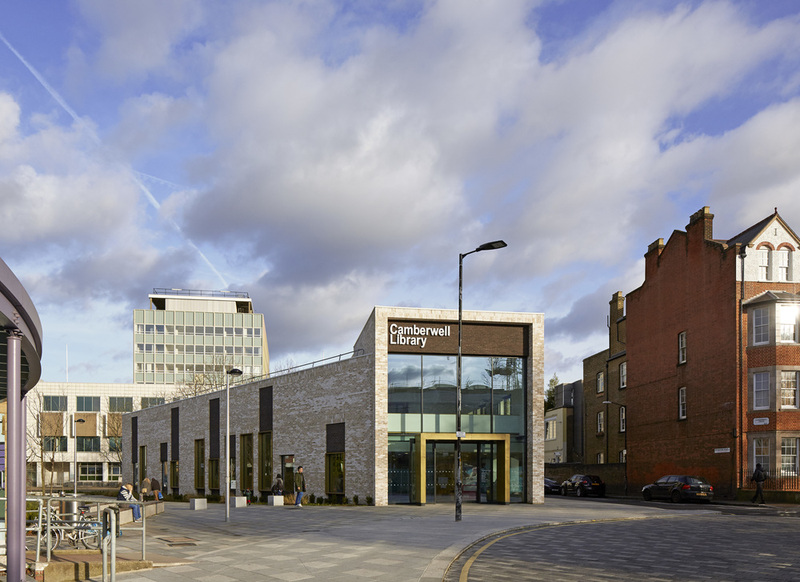 Camberwell library has already proven to be a success, with council figures showing that there have been more than double the amount of new borrowers, visits and items issued since opening in November.